A live Nativity performance is taking place in Market Square, Lisburn City Centre this Saturday 8th December at 1pm. Dean Sam Wright of Lisburn Cathedral worked with the church community to develop ideas of ways the church could engage with the wider community and families. Dean Sam contacted Nativity live scriptwriter Rev Richard A Carter, St Martin-in-the-Fields, Trafalgar Square, London. He generously sent the script to stage a live nativity in Market Square. On the 8th December at 1pm you will see the stable with hay, a live donkey, the Inn Keeper and Shepherds, Mary and Joseph with baby Jesus and the Lisburn Community Choir will all be acting and singing the greatest story of good news for all people. 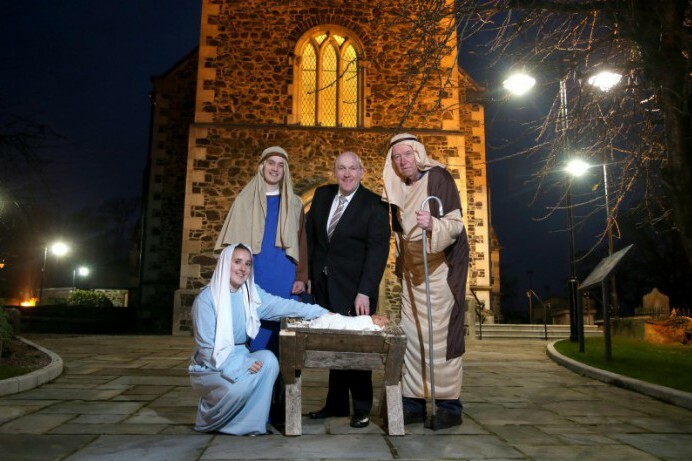 Alderman William Leathem, Chairman of the Council's Development Commiittee said of the event, 'Invite your friends and neighbours along at 1pm on Saturday 8th December to see this special presentation of the Christmas Story in the centre of Lisburn. It really will be a sight to behold. Other attractions as part of the Lisburn Light Festival are a still in place so come down and do some shopping or grab a bite to eat after the play and then stay to watch one of the spectacular light canopy shows. At the ‘Nativity Live’ people are asked to give generously to the Mayor’s charity, the Cancer Fund for Children.